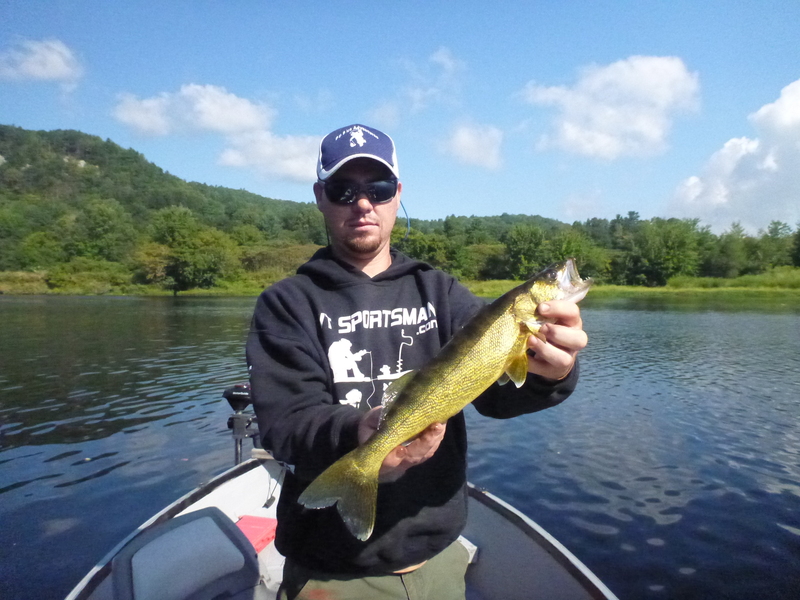 We have been having some consistent success on the river this summer jigging vertical timber for walleye on the river. I spent my labor day weekend searching out more spots that were productive. The portion of the river that we fish mostly averages 8 feet deep. This part of the river also has many sharp turns or bends in the river. These are the places I focus my attention when searching out new locations. When the water is high in the spring, or there is a big storm causing a lot of debris to flow down river, a lot of it piles up on certain sections of the river. These areas can be hard to find without the right electronics, we run the Hummingbird 998c on both of our boats and we also have it set up as a portable unit for ice fishing. This unit has down and side imaging making spots like these a little more accessible. What I look for exactly is a sharp turn that has a small point that jets out into the river. This acts a a cup for debris and timber to stack up in. There are a few things that make this cup productive that you need to keep in mind. At this time in the summer a lot of the walleyes in the river have searched out the deepest holes to wait for cooling water temps and fall. I have seen holes on the river as deep as 40 feet deep. Once I’ve found a deep hole I check all the turns up and down stream of that hole using the electronics. The most productive spots have had debris in at least 10 feet of water with the spots that have at least 12 feet of water being the most productive. Once we have located a spot we search for the fish. Using a 3/8 – 1/2 once (depending on the current) jig tipped with a crawler we pitch to the “dark spots”. These dark spots are shady spots that often times hold the fish. It’s also a plus to have a good pair of polarized sunglasses to help you on a sunny day follow the debris back down towards the bottom. It takes a certain level of imagination skills when fishing this sort of structure. The best locations, once in the timber are at the bases of the tress and directly down current of anything breaking the surface of the water. Another thing to remember is that these spots often get better as the day goes on. Especially on a sunny day the shade from the timber will draw in he walleye in search of shade, while at the same time they still have many great ambush points to feed. We have found that the best pattern is to fish multiple locations quickly running between maybe 5 to 6 spots in a small window of time. This keeps the fish less spooky. I covered a total of 15 river miles and was able to find some more spots up river. Just because a spot has all the criteria doesn’t mean it holds fish. Be patient and you will be rewarded. 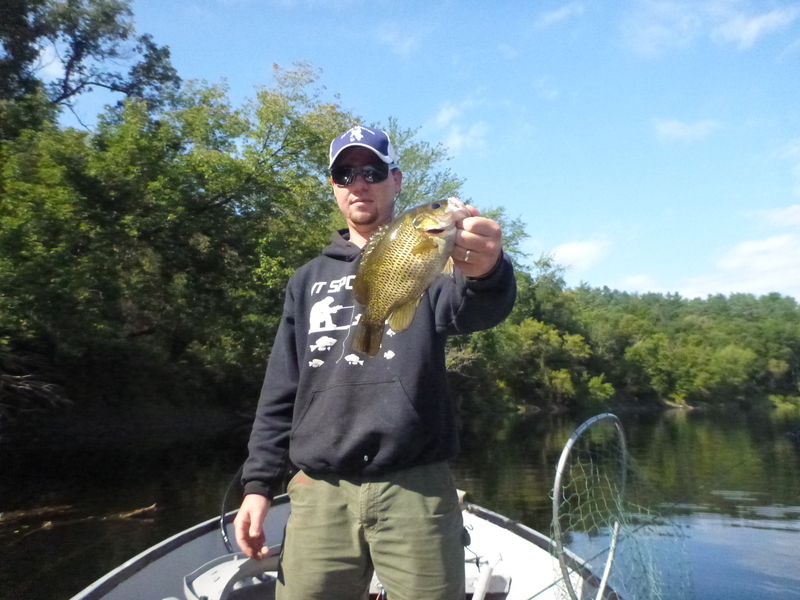 Many of these locations hold great numbers of rock bass and perch, as well as some nice bass. This Eye was caught in 14 fow vertical jigging a cup of timber.